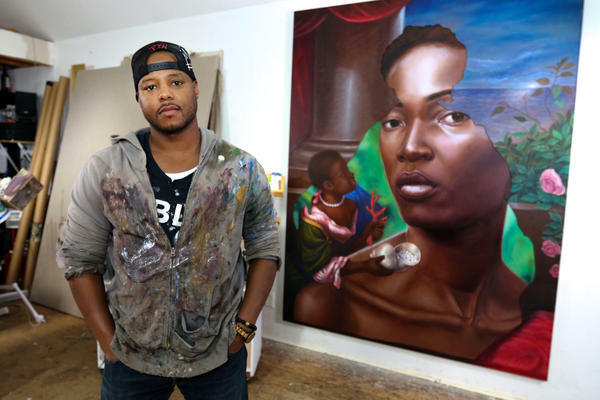 Titus Kaphar often appropriates familiar styles from the Western art canon, but his paintings and sculptures alter the images to point out hidden histories of racism and slavery. 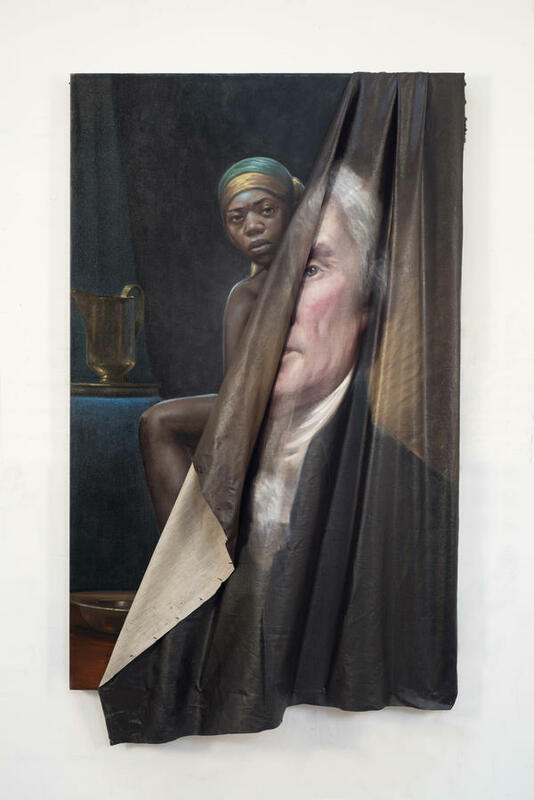 "Behind the Myth of Benevolence" depicts a black woman behind a rumpled canvas containing a portrait of Thomas Jefferson. Guillermo Nicolas and Jim Foster © Titus Kaphar / Courtesy of the artist and Jack Shainman Gallery, New York. 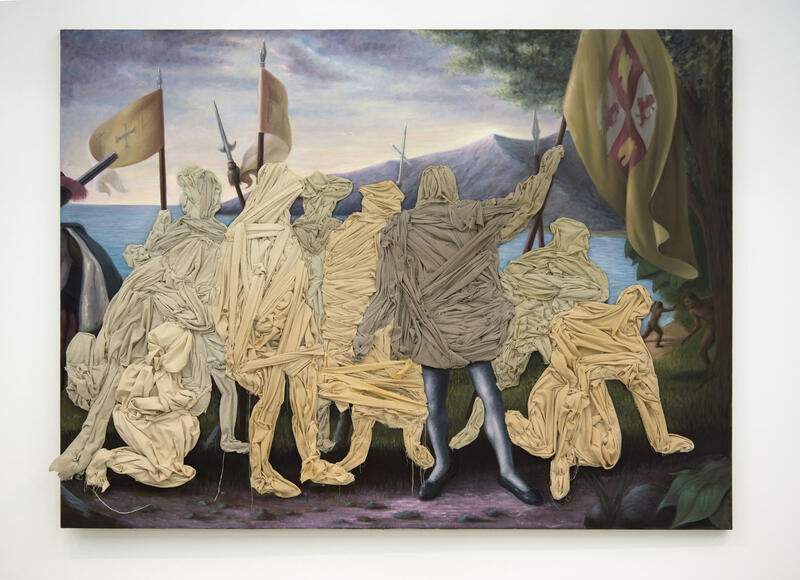 In "Columbus Day Painting," Kaphar recreated an image called "Landing of Columbus" — which has hung in the U.S. Capitol since 1847 — but replaced Christopher Columbus and his crew with cloth. Walk into the National Portrait Gallery in Washington, D.C. right now and you will find a painting that has been ripped to shreds. Another one, nearby, hangs half-loose from its stretcher, rumpled. It's a portrait of Thomas Jefferson; behind it, you glimpse a seated black woman. They are works by the artist Titus Kaphar. He takes familiar images and remakes them. Maybe he pulls a hidden figure to the front. His work often confronts the history of slavery and racism in the United States. "If we are not honest about our past, then we cannot have a clear direction towards our future," Kaphar says in an interview. As of today, Kaphar's work has been recognized with a MacArthur Fellowship — the "genius" grants which come with a $625,000 unrestricted award (paid over five years). The phone call informing him of the fellowship came at his total surprise. "The truth of the matter is: I did not believe the person on the other end," Kaphar says. "And in fact, I said, 'Stop it, who is this?' But no, they reassured me that in fact it was real." On the work "Behind the Myth of Benevolence"
Kaphar: So I had a conversation with a American history teacher. And somehow within that conversation there was this phrase that she uttered: "Yes, but Thomas Jefferson was a benevolent slave owner." And I was sort of shocked by that — I didn't really understand what she meant. And I asked her to elaborate about it, but she couldn't, she didn't. And we sort of sat there in silence for a little bit. I went back to the studio and this is the painting that I made. I'm not in the business of trying to demonize our Founding Fathers. I don't really think there's any benefit to that. But I'm also not trying to deify them. And so that particular piece is kind of pulling back the curtain on these ideas, these illusions, these stories that we tell ourselves about the Founding Fathers. Kelly: And to do that you're literally pulling the canvas of the traditional portrait down. Kaphar: That's right. And that really has to do with trying to, for myself, find a way in to these concepts physically. So if you were asking yourself a question ... how do you make a painting about torture, then you change that and ask yourself the question: What does it mean to torture a painting? Rather than making paintings about something, you make paintings that reflect that thing. Let me be absolutely clear. If we are continuing that binary conversation where we're saying "either keep it up or take it down," take it down. I don't feel in love with these sculptures — that's not what this is about. What I'm saying is: The binary conversation doesn't bring all of the issues into consideration. So there's a third option. The third option is: We engage our contemporary artists of this time. In the same way that the WPA did, we bring in contemporary artists, we have them make sculptures that exist in the communities that they live in, we present those sculptures in the same community squares where these Robert E. Lee sculptures exist, we pull these Robert E. Lee sculptures down from the pedestal, bring them at the same level as these new contemporary works, and we force these works to engage one another. I think one of our challenges is that we sort of consistently try to make public sculpture in a way that it's a sentence with a period at the end. And inevitably it's not — it's a comma, and there should be a clause after that. Melissa Gray and Matt Ozug produced and edited this interview for broadcast. Patrick Jarenwattananon adapted it for the Web. Walk into the National Portrait Gallery here in Washington right now, and you will find a painting that has been ripped to shreds and those shreds nailed to the gallery wall. Another one nearby hangs half-loose from its stretcher. It's rumpled. It's a portrait of Thomas Jefferson. And behind it, you glimpse a seated black woman. The piece is called "Behind The Myth Of Benevolence." Now, these are works by the artist Titus Kaphar. He takes familiar images and remakes them, maybe pulls a hidden figure to the front. As of today, Kaphar's work has been recognized with a MacArthur Award. These are the so-called genius grants. And Titus Kaphar joins us from New Haven, Conn. First of all, welcome. And second of all, congratulations. TITUS KAPHAR: Thank you so much. KELLY: I want to ask, what was going through your head? What was your honest reaction when the phone rang and you got this call? KAPHAR: (Laughter) The truth of the matter is I did not believe the person on the other end. KAPHAR: And in fact, I said stop it. Who is this? KAPHAR: But no, they reassured me that, in fact, it was real. KELLY: I want to let people hear a little bit more about your work for people who aren't familiar with it. So start with that portrait of Thomas Jefferson that I described. Talk to me about what you're trying to do here. KAPHAR: So I had a conversation with a American history teacher. And somehow within that conversation, there was this phrase that she uttered - yes, but Thomas Jefferson was a benevolent slave owner. And I was sort of shocked by that. I didn't really understand what she meant. And I asked her to elaborate on it, but she couldn't - she didn't. And we sort of sat there in silence for a little bit. I went back to the studio, and this is the painting that I made. And so that particular piece is kind of pulling back the curtain on these ideas, these illusions, these stories that we tell ourselves about the Founding Fathers. KELLY: And to do that, you're literally pulling the canvas of the traditional portrait down. KAPHAR: That's right. That's right. And that really has to do with trying to, for myself, find a way in to these concepts that - physically. So if you are asking yourself a question about what is it - how do you make a painting about torture? Then you change that and ask yourself the question, what does it mean to torture a painting? Rather than making paintings about something, you make paintings that reflect that thing. KELLY: It sounds like if I'm hearing you right, your big point isn't, we got to forget the past; we're going to erase it. It's, we have to shift our gaze and confront it. Why - I mean, why does it matter to frame it in quite that way? KAPHAR: I don't think that pretending like it didn't happen is beneficial. I think it's, in fact, damaging. I think if we are not honest about our past, then we cannot have a clear direction towards our future. And so, you know, we're having a sort of national conversation right now about public monuments. And in this discussion, we are talking about - we have this sort of binary conversation about keeping these sculptures up or taking them down. And I actually think that that binary conversation is problematic. I think there's another possibility, and I think that possibility has to do with bringing in new work that speaks in conversation with this old work. It's about a willingness to confront a very difficult past. KELLY: So practically speaking, you know, apply that to all the Robert E. Lee and all the Jefferson Davis statues that are up all over the South. Is what you're saying, they can stay there, but let's build some alongside them that makes you think about this man, this history in a different way? KAPHAR: Let me be absolutely clear. If we are continuing that binary conversation where we're saying either keep it up or take it down, take it down. I don't feel in love with these sculptures. That's not what this is about. What I'm saying is the binary conversation doesn't bring all of the issues into consideration. So there's a third option. The third option is we engage our contemporary artists of this time in the same way that the WPA did. We bring in contemporary artists. We have them make sculptures that exist in the communities that they live in. We present those sculptures in the same community squares where these Robert E. Lee sculptures exist. We pull those Robert E. Lee sculptures down from the pedestal, bring them at the same level as these new contemporary works. And we force these works to engage one another. KAPHAR: ...As a finished sentence. Yeah. KELLY: Titus Kaphar, artist, sculptor and now MacArthur Genius Award winner. Thank you so much. (SOUNDBITE OF VULFPECK SONG, "CHRISTMAS IN L.A.") Transcript provided by NPR, Copyright NPR.